Reduces the volume of the turret idle sound to 10%, 25%, or 50% of normal volume. This mod has been integrated into my new mod, Quieter Settlements, which has more options and bug fixes. DO NOT USE Quieter Turret Idle Sounds. Please use the mod above. Quieter Turret Idle Sounds reduces the volume of the turret idle sound to 10%, 25%, or 50% of the original volume. I personally prefer 10%. 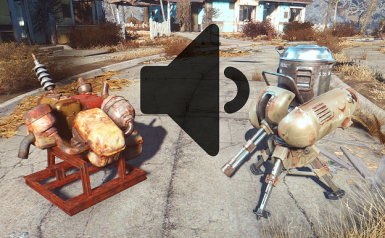 Now the sound of turrets idling won't drown out other sounds in your settlements. 1. Open your Fallout4.ini file found at 'Documents/My Games/Fallout4/Fallout4.ini". 2. Change the line that reads "sResourceDataDirsFinal=STRINGS\" to read "sResourceDataDirsFinal=STRINGS\, sound\"
If you like this, you may also like my Quieter Generator Sounds mod.